I bought a medium. I'm very happy with the fit. And if the worse case scenario happened I feel confident that this helmet is upto the task of keeping me protected. I'm really happy that this helmet has a double D chin strap because in my opinion there the safest and leave no margin for error. It looks great. 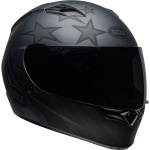 Comes with a tinted visor and a helmet bag to keep it safe when not in use. Overall 10/10 for protection, looks and quality.